Finally a beautiful day and no rain in the forecast! Yeah! 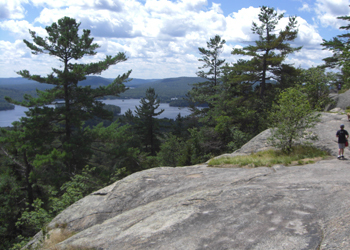 We took advantage of the day and hiked Bald Mountain which is a mountain of solid rock as far as I can tell because most of the trail was on rock! 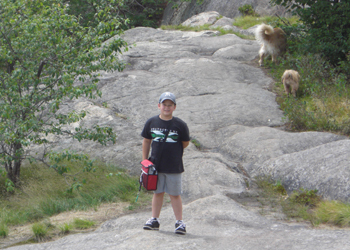 We took Ethan, Paul’s nephew who is 7 and of course he was running up this mountain along with Duke! Me, slow and steady – I didn’t even slip! This is about half way up the mountain and the rock we are standing on is what most of the trail was. 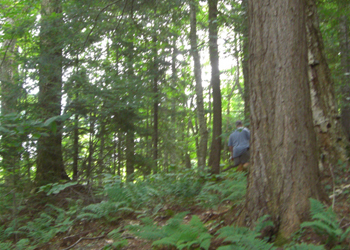 The hike took about 2 hours and then we had a picnic back at the trail head. This is what everyone comes to see! The view from the rock is pretty spectacular but then you can climb the 6 stories to the top of the tower, but only 5 people at a time! Is that 5 adults, 5 children, 5 overweight individuals? No one was sure so we used caution and I climbed up with several children and one dad. Paul and Ethan chose to stay with Duke! 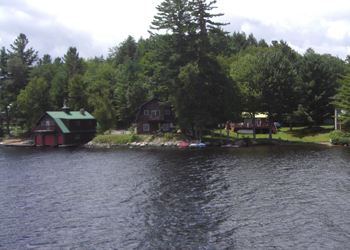 Raquette Lake is where the rich send their children to spend the summer each year. We took a boat cruise on the lake this week and had a wonderful lunch. The cost of the 2 hour cruise and lunch was $35 each and a $6 Bloody Mary, all of which Paul felt was well worth the money! Yep, you read this right, Paul thought the cruise and lunch was a bargain!!! Along with the rich names who have camps here there are two clubs about 1 mile from each other and across the lake from one another. The grounds look beautiful and the amenities look like something right out of Parent Trap! I didn’t even know these kinds of places really existed. Apparently these kids come here year after year from all over the world and spend 7 weeks of summer at camp for the low price of about $15,000 per child! I think my whole family could go on a pretty nice vacation for 15K but if you have plenty of money and don’t really need to spend time with your kids laughing, playing in sprinklers, eating popsicles and letting the juice run down your arm, backyard bbq’s or just hanging out enjoying the lazy days of summer this is where you send the kids to do these things while you go on your own vacation to some paradise!!! The lake is beautiful and there is so much history here and the captain shared lots of it which I didn’t retain but I still enjoyed the ride. Most of this lake is only accessible from the water and many of the camps are camps that have been in families for several generations. 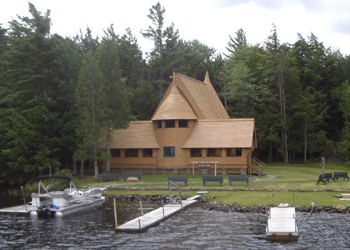 There is even a church that is accessible by boat only. It was a very interesting looking church where the shingles were on all the walls and the roof. Much of the shoreline is beautiful and green right down to the water but many areas have camps from little tiny homes to large resort type places. 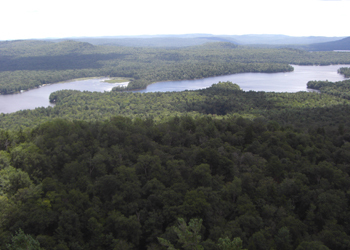 Many of the lakes in the region look much the same as Raquette Lake but it is different in that so much of the lake is only accessible from boat. We drove 1.5 hours through some beautiful farmland to arrive in the town of Little Falls for a baseball game. This was smaller than the SJ giants but just as fun. Ice Cream eating relays, frisbee contests, beach ball relays, so much fun and it only costs Paul $15.50 including dinner! The fun ended when the 10% chance of rain turned into a downpour about the 5th inning but not before the Umpire made a really bogus call against the home team. The coach and fans were on their feet! Going to a baseball game is always a great time, lousy food, expensive beer, hard seats but such an American treat! Last night we attended Judy’s husbands family reunion and what a great time! They fed us a great meal, lots of beer and wine and then homemade apple pie! Not only was the food great but everyone treated us just like family and then they had the family talent show! The talent was awesome, the showed opened with a just 10 year old cousin singing the Star Spangled Banner that could easily compete with those stars that sing the anthem at the Super Bowl! Wow, her parents are definitely in for an expensive college career – she is talking Julliard! The following acts were pretty entertaining with a magician that entertained us with his slight of hand and then a mento’s explosion of Diet Coke! They had lion tamers, mussle builders, rocking babies, poets, and a granny that had a hidden life of poetry in the 60’s in New York City – very funny stuff. 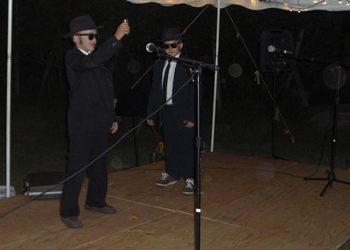 My favorites were both acts that the nephews were in, The Constipated Caterpillar and the Blues Brothers! 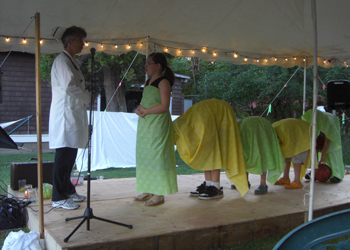 David and Ethan are the middle humps of the caterpillar and this was such an entertaining skit! See the basket ball? yep, it comes out in the end after a little lesson about fiber! Where do people come up with this stuff? They were so cute! They lip synced but the moves were so cool! 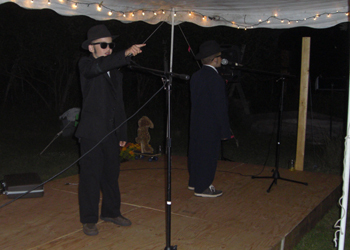 I thought I was really seeing Jake & Elwood in Concert! Posted in New York | Comments Off on This is just too Funny! So far we have seen a couple of concerts in town, a boat show and enjoyed working the winery for there Grand Opening. 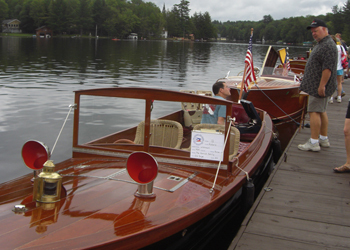 The boat show was about 30 antique wooden boats that had been either very well kept or refurbished and these boats all looked like they were being used currently, not just for show. There are 8 lakes in a chain and you can access all of them without leaving the water – one of them you have to walk but the rest are navigate from a boat. 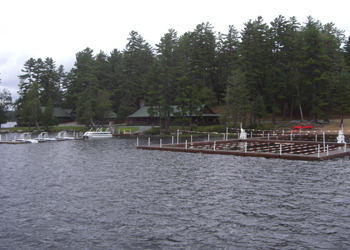 The most populated one is 4th lake which is the lake where Paul’s family had a resort. We went there to see the place and it is way different now, not nearly as resort like but still the same great view of the lake. We stopped into the bar that had our New York Wedding reception and had a drink! Amazing views. With all this outdoor adventures we have decided that we need some supplies! 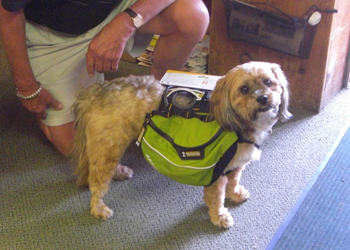 We didn’t buy it cause it costs $65 bucks but it is a great idea although we all agreed that he would be really slowed down if we start having him carry his own supplies! 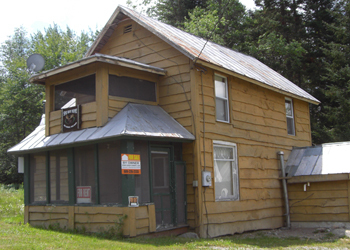 2 bedrooms, 1 bath & screened porch! 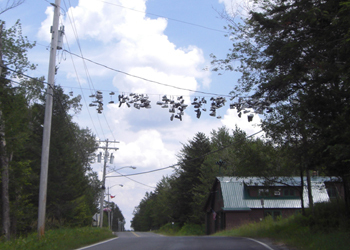 A small town with a lake about 10 miles from Old Forge. We stayed here when the girls were 4 & 5 for a month. It is at least 5 miles from real civilization but quite beautiful other than the house is very creaky!!! Paul and I drove here the other day just to see what it looked like now. Not much has changed!!! These shoes have doubled in the past 20 years! The past 2 weeks has been full of hikes, canoe trips, concerts, boat shows, little league, swimming and visiting old friends. 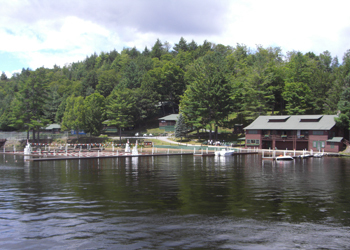 The Adirondack State Park in the town of Old Forge is a cute little town where the summer population grows with all the people that have summer camps. There is so much to do here that we are not even sure 2 1/2 months is going to be enough time to do the things we were hoping to. There are a lot of deer and bears in this area. One evening the neighbors got there bird feeders distroyed along with a 5 gallon tub of bird seed that was sealed and clamped shut – the bear just smashed the tub! Everyday around town you see deer. This little family we have seen most days near Paul’s sister’s house. Our first night in town we were having dinner at Judy’s and the deer were in the yard begging for food just like a dog! One of them stuck his head right up on the deck railing and took an apple from Ethan’s hand. (Paul’s nephew!) 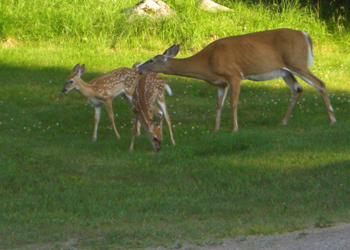 It is so odd to see deer just wandering through yards, around businesses, and along the roadways. 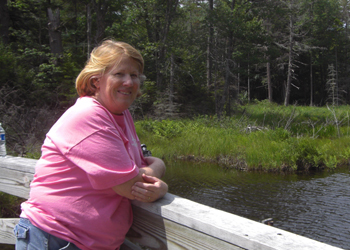 We took a canoe trip down the Moose River with Judy, David & Ethan one day. 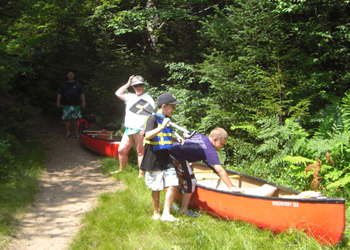 The canoe company takes you about a mile up the road where you put your canoe in and then you are off for about 4 hours canoeing back to the base! The river has so many twists and turns that we paddled most of the time with only a little time out for swimming and lunch to go the short distance that we traveled by car. 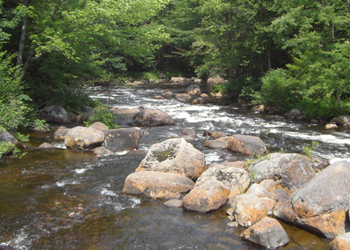 This is the spot where you had to take your canoe out of the river and walk a ways across the river and put back in beyond these rapids! They really didn’t look too dangerous, only shallow but the canoe company requests you take out here and walk. It was a good time to take a short break. 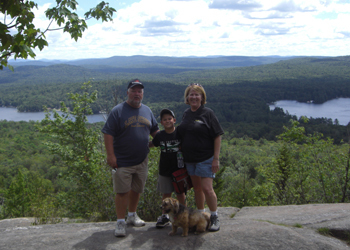 We have been trying to do at least one hike each week around 3- 4 miles. 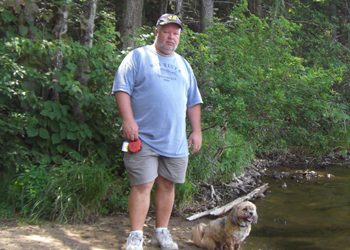 This one was to a nice little lake that was only accessible from the hiking trail. 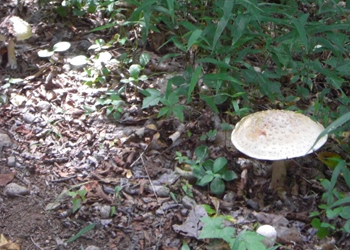 They had several walk in campsites that looked really nice but there was no ELECTRICITY! 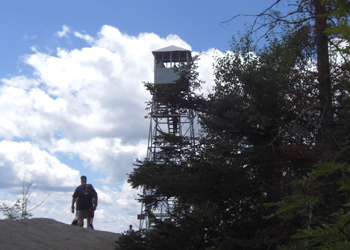 Great for hiking but we are kind of use to amenities. Duke has become a water dog! This hike was 2.5 miles and went all the way around the lake. 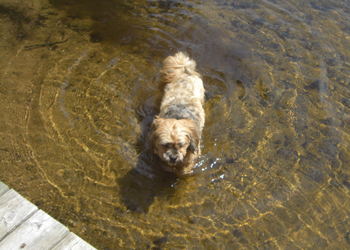 Everytime we came near the shore, Duke went right for the water. He has definitely become a water dog. The only problem is it is so damp here that he stays wet forever! A bridge across the inlet stream. 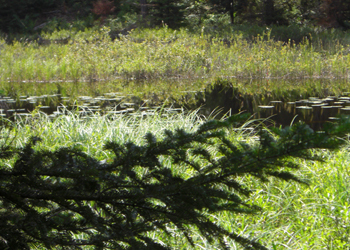 Another hike took us to a pond that was very hard to get to. Grass pond was a pretty strenous hike up a mountain and then thru swamp areas. It was beautiful with no one around but when we got to the pond, about 2 miles there was no way to get to the pond for a swim so we just looked and made our way back to the trail head. 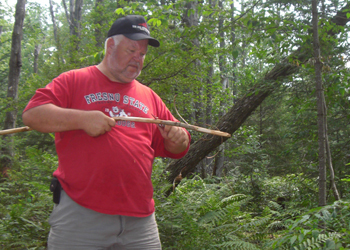 Paul carving a hiking stick. We definitely needed these! Posted in New York | Comments Off on Just having too much fun! Paul has been gone over a week now and I survived; the power, TV, and Internet all still work! I have been staying busy hanging out in the RV park which has been very quiet until yesterday and now of course it is full of weekend visitors. It is so much fun watching everyone arrive, set up the RV or tent, roll out the carpet, set up the chairs and start a fire! There are so many fires going that last night when I returned home from town you could see this huge cloud over our campground. I love walking around the park meeting people and of course Duke is meeting many friends. This past week has had some interesting weather. Monday it rained so hard that I thought we would float away. That is not far off as the river came up really high from the run off. Several of the seasonal sites on the river were flooded until yesterday afternoon. One trailer was sitting in several inches of water and their fire-pit looked like it’s own little island! By last night the water receded and this morning they were sitting around the fire-pit already!! Wednesday it was so cold that I had to get out an extra blanket for the bed and the heavy coat during the day. Today it is beautiful blue skies and about 80 degrees. 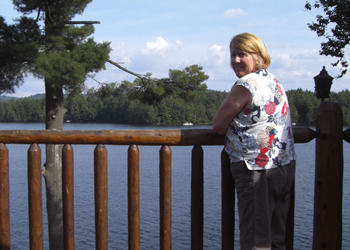 It is a spectacular 4Th of July weekend here in Old Forge. 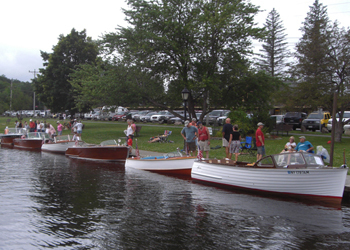 The local economy relies on this weekend and labor day to carry them through the winter. Tonight the group around us who are mostly seasonal folks had a potluck and I joined in. Just like everywhere they were curious about this lifestyle although no one was ready to join in one couple said they were going for it when their daughter was old enough. Hope everyone is having a great weekend. Enjoy our independence.